Η Μύκονος είναι ένα όμορφο νησί στις Κυκλάδες, θεωρείται κορυφαίο νησί για τους τουρίστες. ένας μικρός παράδεισος ο οποίος βρίσκεται ανάμεσα στο νησί της Τήνου, στη Πάρο και στην Σύρο. Διαβάστε περισσότερα . . .
Villa for 7-8 people on Mykonos4 bedrooms, 2 bathroomsPrivate swimming pool, panoramic views of Tinos, Delos and Mykonos port and the sunset, close to town but in a very quiet and peaceful area of Mykonos. ACCOMMODATION Rooms - Double garden rooms: Situated amid beautiful manicured gardens and designed with special emphasis on luxury and comfort, the spacious double garden view rooms are ideally situated and the perfect choice for an idyllic retreat. Immaculate and tastefully decorated in muted shades, they provide the ultimate in maximum comfort and luxury. 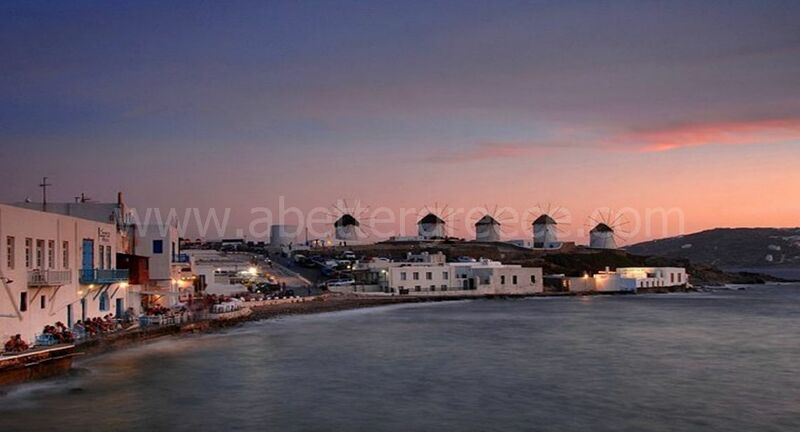 The hotel is built according to the traditional architecture of Cyclades. The white building with the blue windows is a representative sample of insular construction.The Cycladic atmosphere and the brininess atmosphere will give you beautiful memories from your vacation in Mykonos and especially from your staying in area Platis Gialos, in the Silent hotel. The complex is located at Glastros, on the road towards the beaches of Psarou and Platy Yialos and within 1 km. of the main town of Mykonos, the port and airport. At a distance of 10 meters there is a super market and the bus stop.HOTEL FACILITIES. The tastefully decorated rooms are available with views over the beautiful bay, the rooftops of Mykonos Town, or the relaxing courtyard, with its swimming pool and garden. All our rooms offer air conditioning and en-suite facilities, as well as a reliable wi-fi connection. The hotelThe Pebbles Hotel, built in traditional Mykonian style architecture, is located in a very convenient location just a few minutes’ walk to the town center and the old port of Mykonos. Several terraces offer stunning views of Mykonos and the Aegean Sea. Spend the day lounging by the pool, then join us for sunset drinks and enjoy lingering into the twilight hours. Walking on the most famous street of Mykonos, the Matogianni Str., you will find the Hotel Giannis and 'The White Bar' right in front of the hotel.One of the oldest hotels in Mykonos, it was renovated in May 2007.The famous and popular shops of Mykonos are within a few steps! While enjoying your time in the city center, anytime and within minutes you can be in your room. Matina Hotel, established in 1958, last renovated in 2010, built in traditional Mykonian style, is well situated in the heart of town with access to all major points of interest: beaches, museums, restaurants, bars, night clubs, shops, banks, transportation.